When but a wee lad I was convinced that the banjo minnow could work miracles. Truth be told, I never actually fished one, not even once. It wasn't for lack of owning them. I badgered my parents until they purchased a set. Still, they never touched a body of water, though I can't remember why. Many an hour was spent watching bass fishing shows like Bill Dance Outdoors and Fishing with Roland Martin. It was the closest a little kid could get to fishing all the time, being too young to drive. The bug was bone deep from a very young age. I ached to be on the water, it called to me, and yet I was at the mercy of those with the means of transportation. The time was not wasted though. 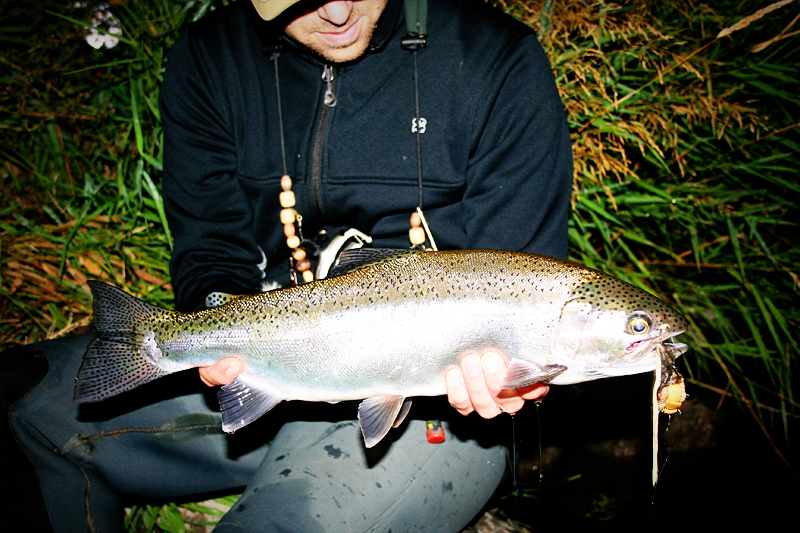 A thirst to understand the whys behind the hows of catching fish was growing, and an attitude of exploration resulted. When you can't be fishing in body you can certainly be thinking about it and that leads you to wonder how to better do it, where better to do it at, and the whys behind both. Trying to think like a fish results in success and turns fishing into a myriad of mysteries to solve, and repeated success makes you feel like you're slowly solving those perplexing puzzles. It's intoxicating. Like the watch-maker slowly taking apart a new watch to see how it runs, anglers can try to pull apart their experiences on the water, and trying to recreate the good times becomes a satisfying game. There will always be fish that refuse catching by traditional means. For these fickle fins some would give the perfunctory "oh well" and move on to an easier quarry. Some assume because nothing is caught, nothing must be there. These mysterious creatures dance to the beat of a different drum. Their feeding habits are far different from the bulk of fish seen feeding throughout the day. Catching any fish of any size is a hoot, but there is something addicting about trying to get the ones that rarely get got. 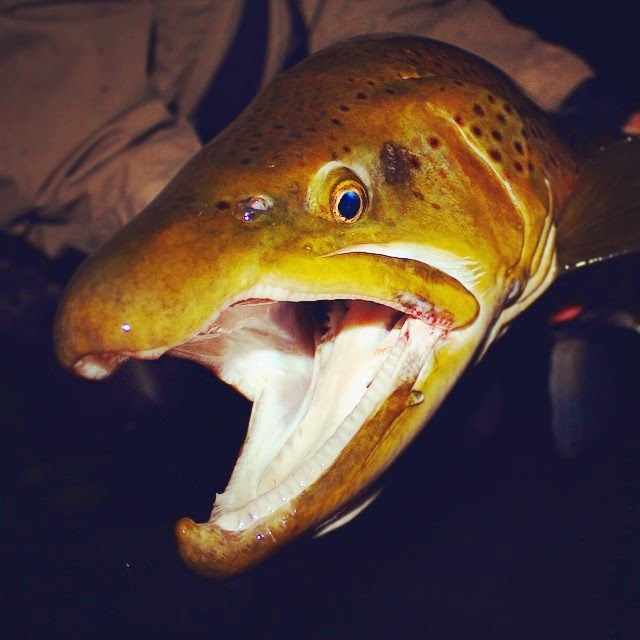 I am prone to think that there are more of these hard-to-catch fish in most moderate to larger sized watersheds than our angler egos would like to think exist. A river's biomass can tell you a lot about the fish you aren't seeing. It was to be this years angling focus, my "fishing goal" if you will, to unravel this particular mystery. Mice are not often thought of as potential piscatorial morsels. Simply put, most people don't realize that fish eat mice. How could they? Why would they? Where would it even happen? 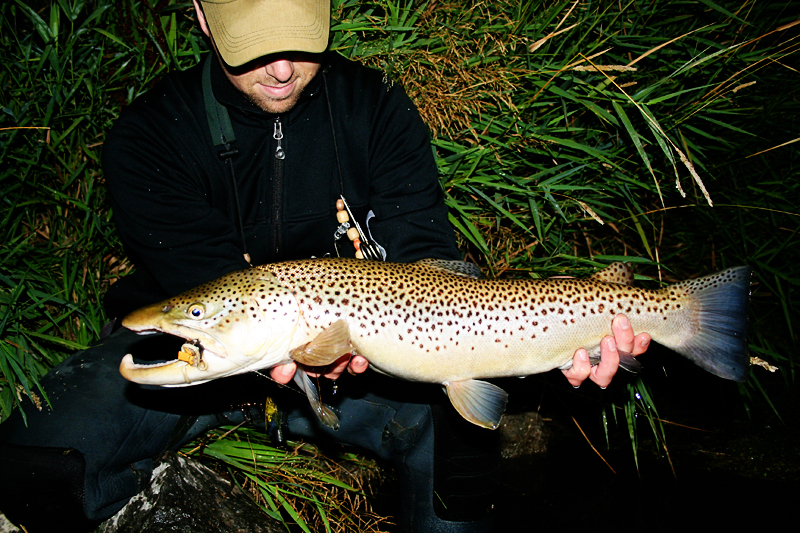 (can you picture an obese brown trout waddling onto land, in the dark, a maniacal grin on its face, and sneaking up on a poor unsuspecting mouse... I smell a campy horror movie in the works. Move over Night of the Clown, it's Night of the Brown!) When would it happen? I think it's safe to say that only a small handful of people in the world have ever witnessed a mouse being eaten by a fish in the wild. Sure, there are some places where mice are stupidly abundant, but even in those places I wonder how often the actual event is witnessed. If you're still in doubt a simple internet search will reveal that it does in fact happen though. I think we would be surprised to see what is in most big fish gullets. Maybe we just need larger stomach pumps to witness the mayhem. Mousing has slowly grown in popularity over the past few years, though its newness is like that of a new, used car. Some folks have been in the fishy mouse club for years, and the tactic has still managed to fly under the radar. Movies like Once In A Blue Moon and Eastern Rises really made a splash among anglers, and brought a greater awareness to the fish-eating-mice phenomenon. Social media has also played its part in the past couple years, to some people's chagrin. Mousing in Alaska has become quite the craze and more is being written, photographed, and filmed about fly fishing with mice every week. Deer in headlights look saying, "Did that really just happen?" If you are just tuning in, there are two previous posts that would be worth your time. Together they preface this post. 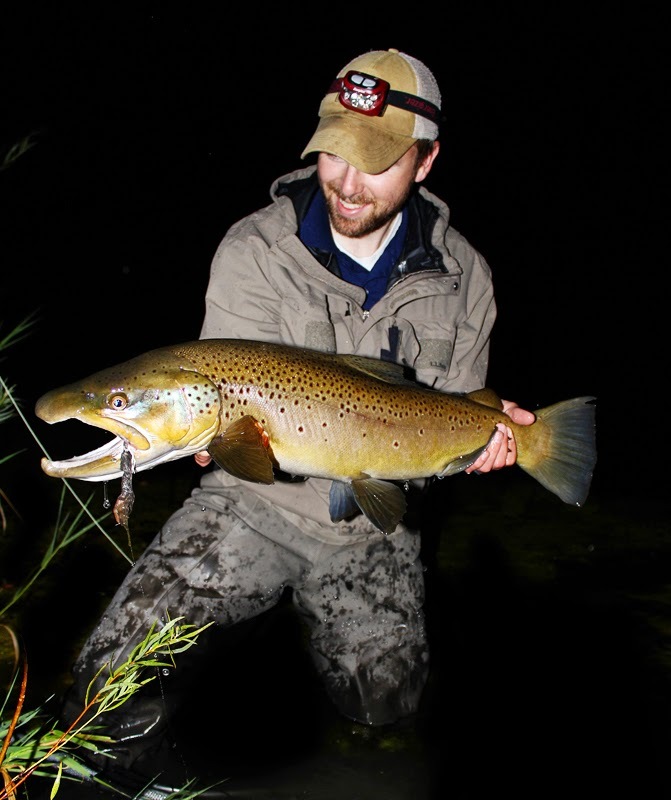 Check out Night Fishing - Part 1 "The Basics" and Fly Tying the Artimouse to get up to speed. Mousing is an addiction that may be good not to acquire; especially mousing at night. You'll lose sleep when you should be snoozing and when at work you might find yourself slowly drifting into a hazy daydream, as the memory of that massive and loud explosion in the water returns to haunt your thoughts... if only the hook had stuck. For trout I can think of no other way of fishing that produces such violent and entertaining takes. The still, calm of the night is ravaged by generous amounts of sound and roiling water when a fish decides to take a mouse. 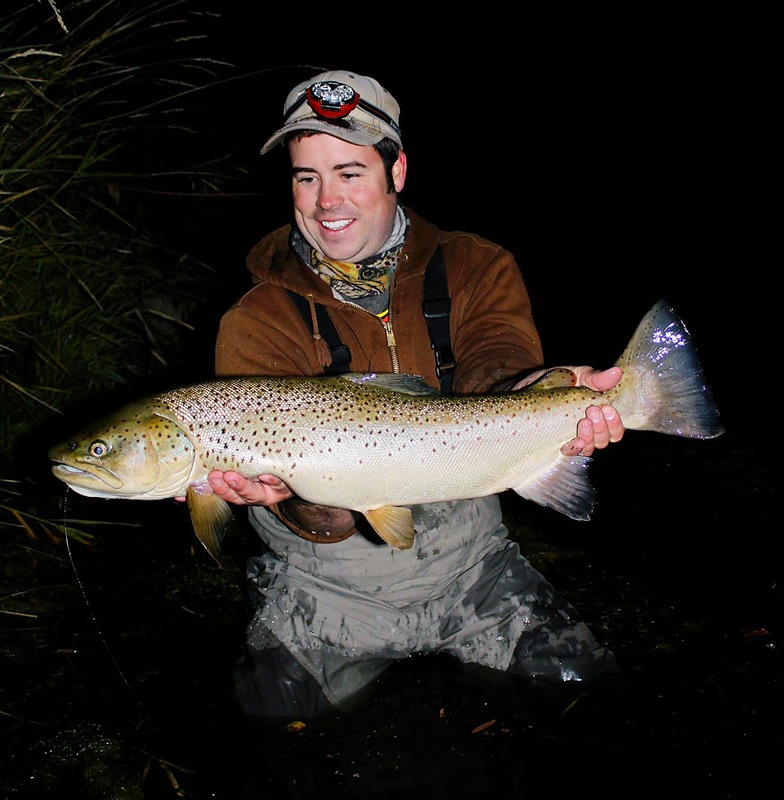 It's not dry fly fishing, but more like streamer fishing on the surface of the water, where you can't help but witness the gleeful carnage. Again, mousing can be remarkably addicting, though it is not without work. So, to the curious angler I say, give it a try, but be careful, you might unknowingly be joining the midnight mousing club. Just do it. Fortunately, most places have mice. 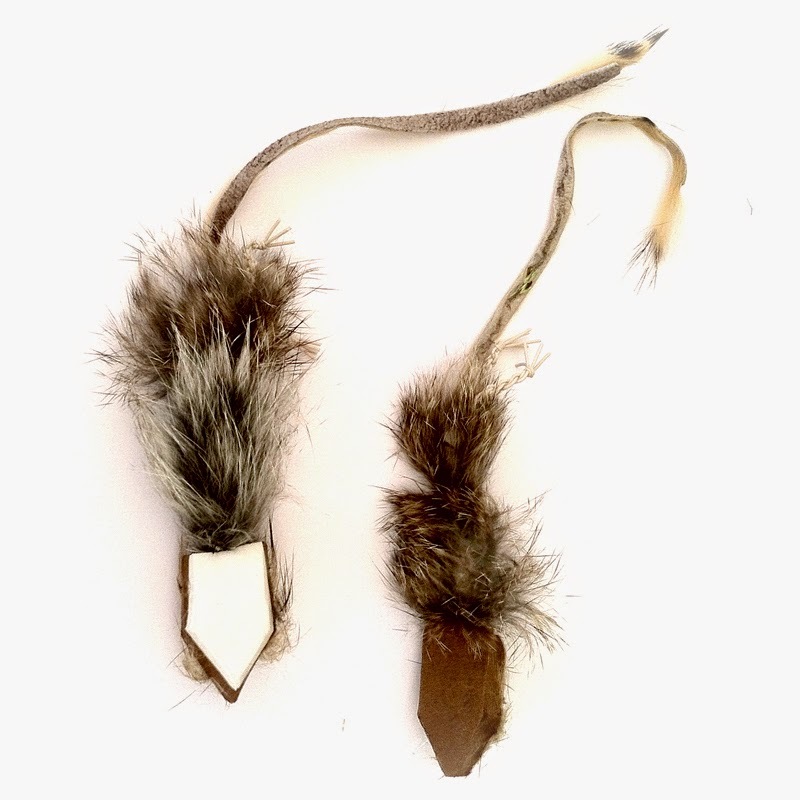 You don't have to plan and pay for some elaborate Alaskan adventure to stick fish on mice. There is a secret to it though; just do it. The biggest and best advice I could give on mousing is to just do it. 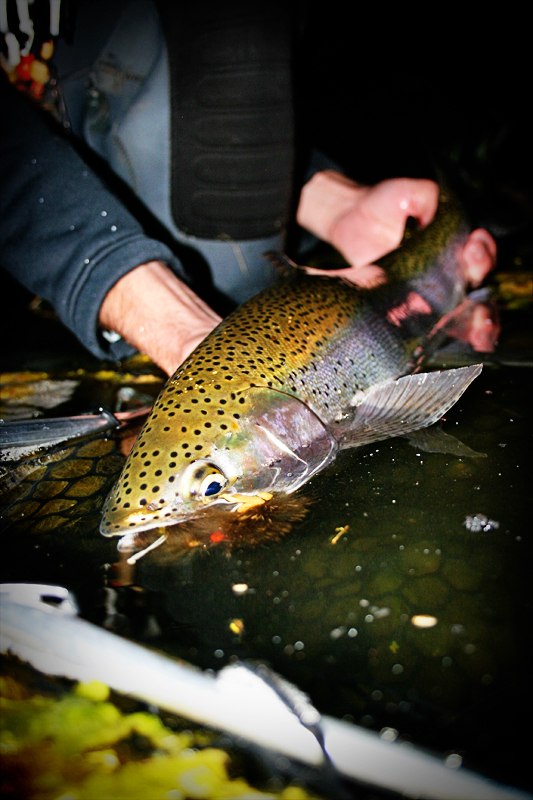 The more your fly is in the water the more likely you will find success. It is the universal truth of angling. Most folks tie on a mouse, cast for maybe an hour and then give up and switch to one of their usual patterns. I am by no means an expert on any topic of fly fishing, but I do find success on occasion. It's not because of some great mystery, or from knowing the secret honey hole, no, I just work to understand the why, when, and hows, I don't give up after a bad day on the water, and I keep my fly in the water. Granted, certain waters are more productive than others, but you won't ever know that unless you explore and try. What people don't see in the reports on success is all the skunks, misses, and time spent exploring. There is far more of those things than actual catching, but that is all part of the enjoyment and makes the successful moments much sweeter. So again I write, just do it. Wouldn't Nike be proud. Explore, try different flies and techniques, and have confidence. One good experience will carry you to the next. As for mousing, if you don't enjoy the process of fishing as much as you enjoy the catching, it may not be the technique for you. There's a good chance you won't catch anything with a mouse for the first couple trips, then again, we all get lucky here and there. Learn to think like a fish. Fish have an inborn knack for weighing pros and cons. It's a cost vs benefit kind of conundrum that determines their survivability. Not all fish will eat mice, and not all of the fish that will eat mice are willing to do it during the day. It appears to be a learned behavior, somewhat like an acquired flavor for a human is learned (moldy cheeses and dark chocolate aren't for everyone). Fish are constantly weighing the benefits against the costs for eating any given thing. 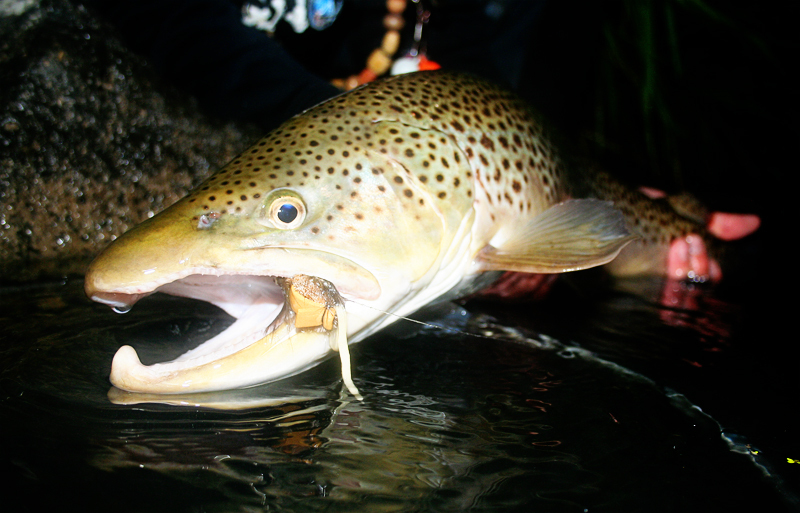 Is the cost of chomping (or tasting) that floating animal worth the benefit the trout will get from it? If a fish thought as humans do, it might ask itself some of the following questions before feeding on a mouse: What are the chances I will get snatched or injured by a predator if I move from my cover? Will that little animal attack back? How far and fast do I have to swim, and do I have the energy to do so? Can I actually get that thing in my mouth? (I doubt fish try to eat otters and beavers, though sometimes their eyes are bigger than their stomachs) Does that thing even look like food, or is it a stick or moss? Should I taste it anyway? Am I even hungry? I think you get the idea. There are a lot of concerns to mull over and fish seem to have a natural ability to analyze various scenarios, and sometimes all this goes on in a matter of seconds, depending on the speed of the current. Their ability to discern seems to improve with age. Ever notice how the littler fish are easier to catch? Understanding the cost/benefit concept can improve our angling considerably. Learn what mice look like in the water. I already described it in the "Artimouse" post. The darkness of night is a game-changer. It lessens a fish's first and probably largest concern; predators. Fish live in a world of eating and being eaten. For us it would be like living in a world with different grades of zombie. Some are more likely to eat you than others (if you don't get what I mean, forgive the nerdness). I know I am far more likely to make a trip to the grocery store when I'm not worried some random stranger is going to run up to me and chow down. I think I like my skin a bit too much for that. With a lessened fear of predators, fish are more accessible because they leave their protective lies (where they remain hidden from most human eyes, and most lures/flies) to "put on a feed-bag" as my dad would say. Fish want their food big and easy, but in the opposite order. The Habitat. Understand ideal mouse habitat, but don't restrict yourself to those places. If there are mice, voles, or rats, then they can certainly end up in the water. Mice do not appear to be afraid of water. They are pretty proficient swimmers for their little size. We do not know all the reasons exactly why mice get into the water. Some say they are in search of food and have poor judgement for what is passable versus impassable waters. Others say that mice accidentally fall in. I am prone to think that it is a mixed bag of reasons. I'm also of the opinion that mice are sometimes scared into the water by predators, or dropped by them in the struggle for survival when being carried through the air. All the more reason to SLAP that fly down! 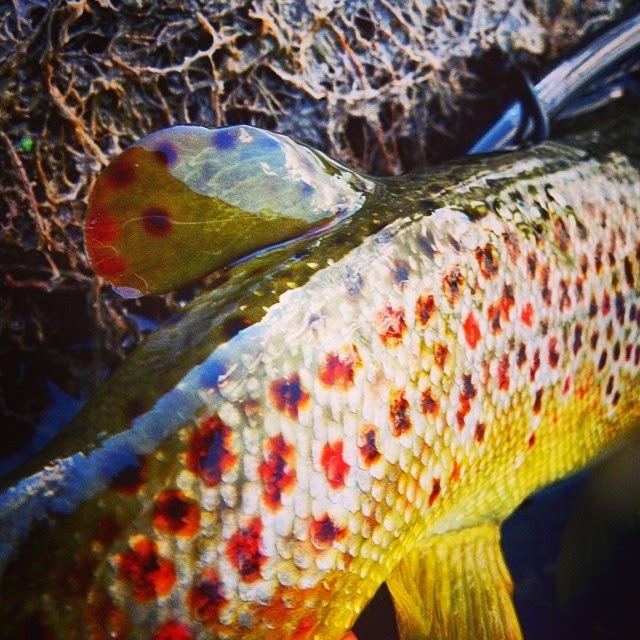 A fish that is in ambush mode, wherever they may be, will take something that looks tasty and high in protein, but I also think that the odds of getting a take increase when focusing in areas that mice are more likely to either fall into the river, or be pushed to by the current, after getting in the water. Looking for this kind of water is less of an issue at night for a couple of reasons: first, mice are nocturnal. This means that they are much more active at night, and thus more likely to fall into or get into the river when the lights are out. They are like fish and have much less fear of predators in the dark... silly mouses, you should know better. Secondly, because larger fish are more confident and active at night, they leave their protective lies in search of feeding lies. This is generally slowing pocket water along the banks of the river where larger prey can become available and be observed before a fish actually eats. For more on ambush water and differing lies, refer back to Part 1 "The Basics". 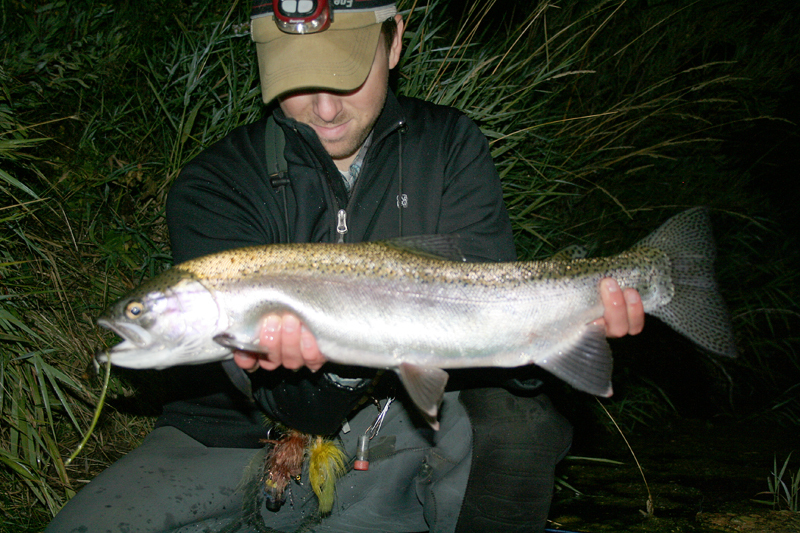 Even in the dark of night, it isn't a bad idea to fish close to cover, like log jams, undercut banks, and slower moving water that is next to deep fast moving water. Cover a lot of water, and don't be afraid to cover it again. When fishing mice we are looking for the willing few, not the eager masses. As mentioned earlier, not all fish will eat a mouse, but those who will don't usually wait around. It is quite common for takes on a mouse to occur shortly after the fly hits the water, and the takes are usually explosive. In most cases it isn't necessary to make more than one or two casts in a given spot. This means covering a lot of water to find the ones ready to play. In lakes or lake-like sections of river repetitive casting can be productive because fish are moving around looking for things to ambush, but in most moving waters the fish sits in a certain zone waiting for something to float along and ring the dinner bell. Often if I get a blowup in a certain spot I will rest the spot and come back to it. Most fish that blowup on a mouse are unlikely to do so again right after the first burst of bravado. Make a mental note to hit it again on the way out and move on. Leave the boat where possible, it can be easier to "foot" the bill. Boats are fantastic and give us access to many otherwise inaccessible waters. They do make mousing difficult though, mostly on longer floats. Mousing requires the slow, methodical finesse of an angler combing the water. In short, mousing from a boat in most cases causes us to fish the mouse too fast. When using a boat for mousing it requires the rower to have a lot more speed regulation, which results in a much slower float and tired rowing arms. Also, when retrieving the mouse from a boat it is generally difficult to keep your fly right up against the bank. If you can compensate for these two issues a boat is an excellent help to cover a lot of water, just remember to take it slow. Resist the urge to set, you gotta feeeeel it. I think this is one of the hardest parts about fishing a mouse, because the takes are so wild. When the water explodes, the last thing you want to do is keep calmly stripping, but that is the best thing you can do. It's not even a bad idea to stop stripping or slow down altogether if you don't feel anything, because it gives the fish a moment to find the mouse it was trying to drown. If there is tension, by all means go all Bill Dance and strip-set on that troutface, but if you don't feel it, chances are you are going to violently fling the mouse right out of the zone, and maybe even spook the fish (flying mice would freak me out too... oh... wait... bats, nevermind). This one rule has doubled my hookups, and when mousing, increased hookups is a big deal. Understand you won't always catch fish, but the one you get probably won't be all that bad. You need to have the right attitude. 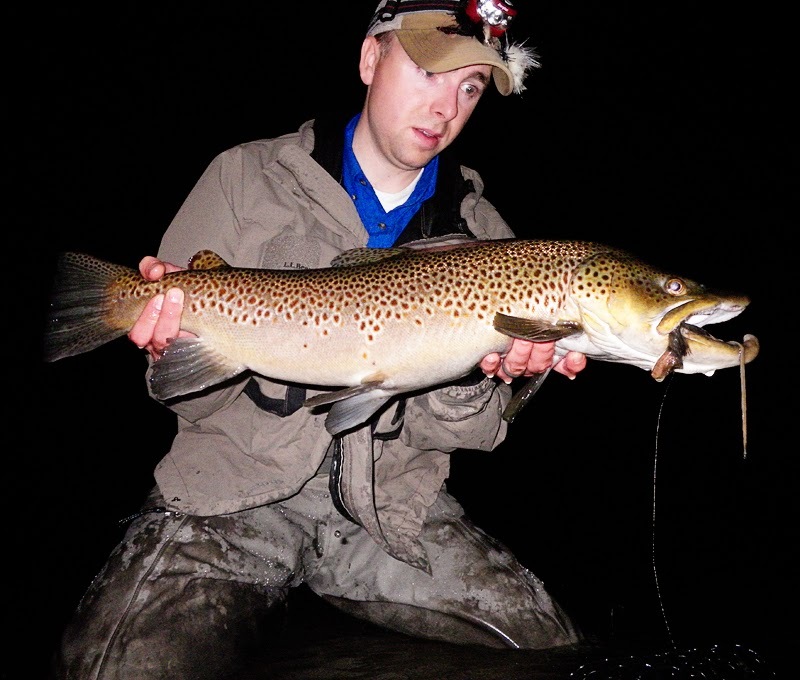 Mousing simply to catch fish with a mouse pattern will leave you without disappointment. If you are mousing for a monster you might find a long wait, though admittedly your chances in size increase. If you sign on for the game, just realize that there may be far more fishing than catching. Rod, line, and leader matter. 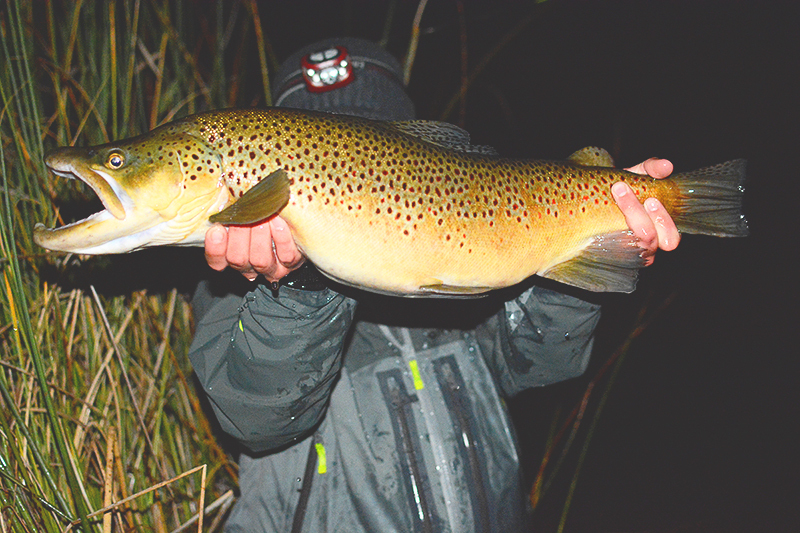 As most guys who have thrown larger streamers know, you go big, you get wind-resistance. When flinging a hypodermic needle-like bit of fur and foam to and fro through the air, when it is dark and you can't see, it is a good idea to use a rod that will give you the most line control possible. 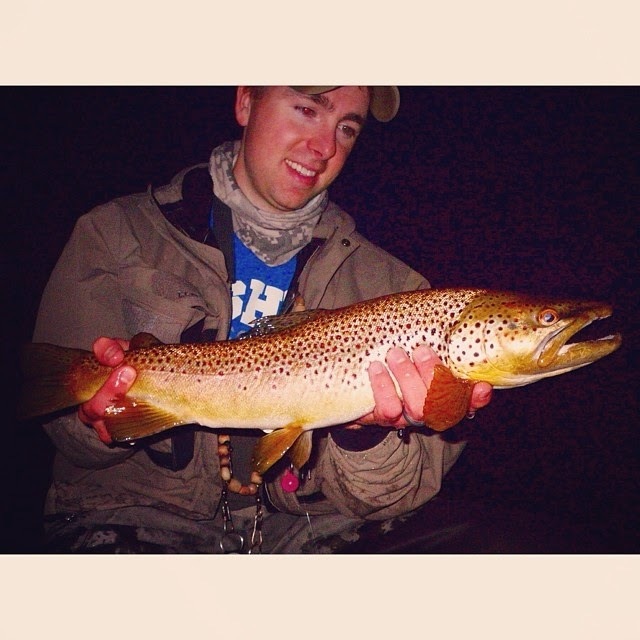 For this reason, I use an 8wt, fast action fly rod. Some may say overkill, but there have been times I was grateful for it. Also, my arms aren't too tired from fighting the line and fly while casting. When mousing, a floating line is the clear choice, for obvious reasons. I fish a short leader of my own making, that is roughly 6' in length. I use roughly 2' of 30lb mono, attached with a blood knot to about the same length of 20lb mono, and then attach that to about the same length of 15lb Berkley Vanish fluorocarbon for my tippet. The reason I go with the shorter leader is it allows me more control over the movement of the fly. When mousing, movement is often the name of the game. The best retrieve is a slooooooow, natural retrieve. While mice are remarkable swimmers for their size, they are still at the mercy of current. It would be worthwhile to look up some videos on youtube to get an idea of just how fast they can swim in still water. No matter how slow the current, unless it is stillwater, a mouse cannot swim against it and make progress. This means that in most cases the retrieve needs to be bringing the fly perpendicular to the current, while still moving slowly downstream, or swimming down with the current. There have been exceptions to this. 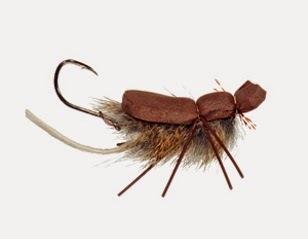 In faster water I have found success swinging the fly and when it hits that bottom of the swing and starts pushing water, the take happens, but I have only experienced this in a couple different places, and they may be trying to take it as some waking insect (like a caddis). This seems to be the preferred approach in Alaska, however, it just doesn't seem to be the most effective approach in the waters I have tried around this corner of Idaho so far. One other thing that I have found effective on occasion is popping the fly, just like a popper. This seems to work sometimes in places that have a lot of frogs, and is another tool to put in the box. 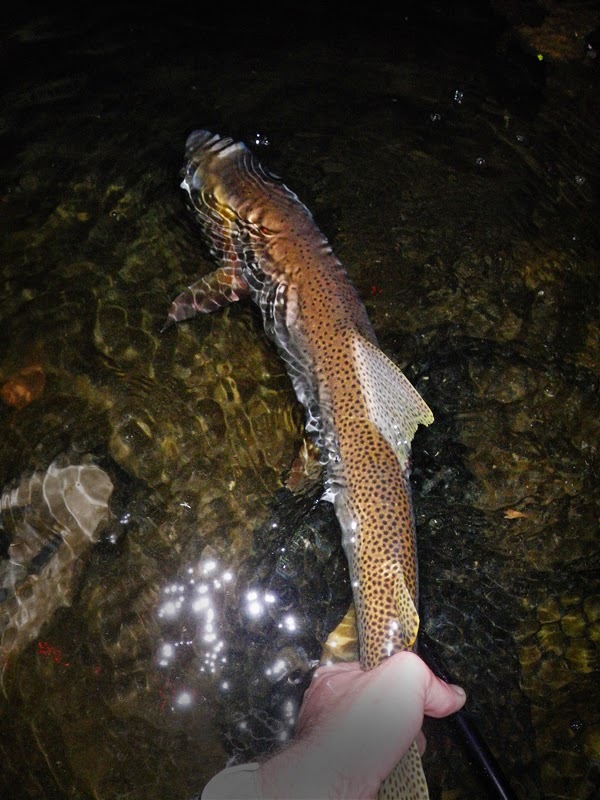 When fishing the fly downward with the current, I usually try not to pull the mouse downstream faster than the current, but just give enough twitch to the fly to look alive, all the while picking up the line that the current brings to me. For fishing a perpendicular approach you actually move the fly, but as I mentioned before, take it slow. When I first started fishing mice I thought the best way to give the fly movement was to wiggle the rod tip back and forth, while slowly stripping at a constant rate. It worked, but I missed a lot of fish because I couldn't feel what was going on at the other end very well. The wiggling back and forth produces a lot of slack in the line, which can also adversely affect the hookset. Rather, I have come to prefer minute pulsating/repetitive twitches, accompanied by a slow constant line retrieve. This has allowed me to FEEL when the fish actually connects with the fly, rather than hearing/seeing a splash and setting the hook with a wish and prayer. Also, the more line you have out, the less effective the wiggling rod tip would be, because the line is still straight in the water and only being tugged, just as if you were twitching it. Sometimes I still wiggle when I'm fishing a hole so close where all that has to be touching the water is my fly, but you have to be careful to not make it so dramatic that it looks unnatural. Be sneaky-ish. While fish are a million times more confident at night, they still seek self preservation, and if anything seems out of the ordinary they will bolt. The biggest thing to avoid is shining your light into the water, especially white light. Be brave and let your eyes adjust to the soft light mother nature provides at night. The less you use the light, the better, and when using it, do so away from the water and use the red light if possible. Also, though less of an issue, strange sounds can spook fish. Try not to talk with your buddy very loud and tread lightly. No ninja status necessary, just don't strut around like an elephant. The more you know the water you are fishing in the light of day, the easier this is. The weapons (flies) of choice. There are three patterns I would recommend, though I am partial to one. One of the first patterns to gain popularity in the world of mousing is the Morrish Mouse, and it has proven highly effective. The MM really shines when you are looking for a fly to move water. The foam back allows for unlimited floatation without a drop of floatant, while the stiff-haired body pushes a lot of water. It is one of the go-to flies used for swinging mice in Alaska. 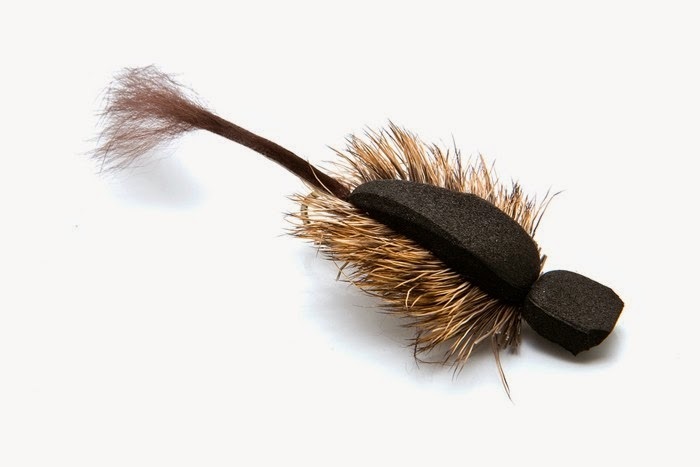 The second fly, and the one I would choose over the Morrish, is the Mr. Hankey. This was another that was developed specifically for Alaska. It's big advantages are found in the soft-haired body, that allows some inherent movement, and the trailing stinger hook. It also has some legs tied in, that can add a bit more life to the whole deception. The hook is designed to ride point up, which can ideally make it easier to cast to cover and not get snagged. Lastly, and my preferred pattern, is the Artimouse. This is a simple articulated pattern with a foam head and rabbit stripped body. It has proven quite effective, in fact, all of the fish seen on this post were taken on the Artimouse. All three are great flies. I wouldn't bother with the full deer hair patterns because they lack inherent movement and require floatant. Even with the floatant they sometimes sink. They are too much hassle in my opinion, though they do look cool and can be effective in catching anglers. Mousing isn't just a night game. Unless you are talking about a remote river in Alaska, or somewhere in Russia, most people tend to think mousing as a nocturnal foray. Contrary to popular belief, it can be quite productive during the day. The trick is to cover a lot of water, but to do so slooooowly and methodically. Identify places where mice can fall into the river, and places they would we swept into by the current. Because fish are less likely to leave their protective lies in the light of day, you have to ring the dinner bell pretty loud by knocking on the front door. What I mean is you have to put the mouse right off the bank or log, practically touching it, and lay it down hard when you do. The splash will get some attention. Then make that little morsel look as lifelike as possible, and swimming downstream right next to the bank(or log) to make it look like it's searching for a way back out. One big advantage of mousing in the light of day, is you get a good feel for what your fly is doing in the water, how fast to fish it and in what ways to move your rod. Much of what I have learned in mousing has started in the light of day and been honed in the darkness of night. Another daytime advantage is that the takes are in full sight and can be quite memorable. I know this post was a bit thick with random info. Hopefully some of it was helpful. Mousing is a blast, and I look forward to doing it more and more. Good luck if you make it out and be sure to share your spoils pictorially so we can all enjoy with you. If you haven't been bored to tears already, here are some other articles that I would recommend. The following is a collection of miscellaneous mousing videos for your viewing pleasure. I pulled out the best I could find over the past couple years. Filming at night is definitely a hard thing to do, so most of what you see in video is from the day. If you have any great vids to add to the list, share it in the comments.